We have a dozen White oak (Quercus alba) trees on our property, several of which are large and overhang the house, patio, and sidewalks. Starting in August, there is a constant staccato of knocks on the roof when the oaks drop their ripe acorns. When the wind gusts, the bombardment from the falling acorns is particularly heavy. And this year, the bombardment has been especially heavy, even on calm days with little wind. Last year, the oaks produced a very small crop of acorns, so much so that I don’t recall seeing any on the walkways. This year, as if to compensate for last year’s meager output, the oaks produced a copious quantity of acorns. Regardless if we sweep the walkways once or twice a day, by the next morning, they are covered with acorns. 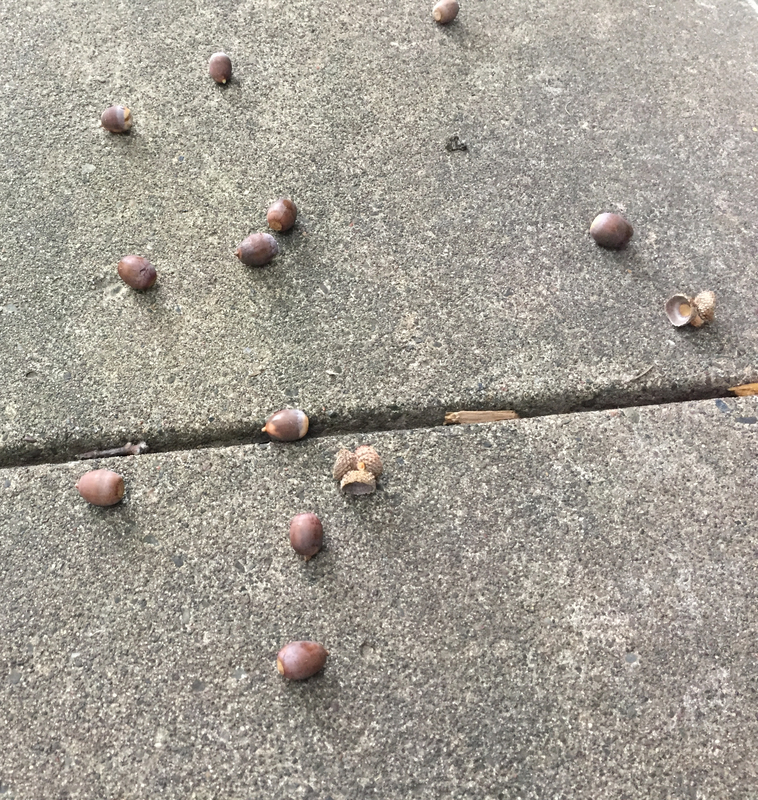 Acorns scattered on a sidewalk. This morning, the bombardment by the back steps seemed strangely intense and concentrated. Looking out the window, I saw two acorns hit Lizzie in quick succession. When I went to investigate, I saw a gray squirrel up on a branch. It was the cause of the intensified bombardment! After the squirrel had ran off to a different tree, I ran inside the house to retrieve my phone so I could take photos. 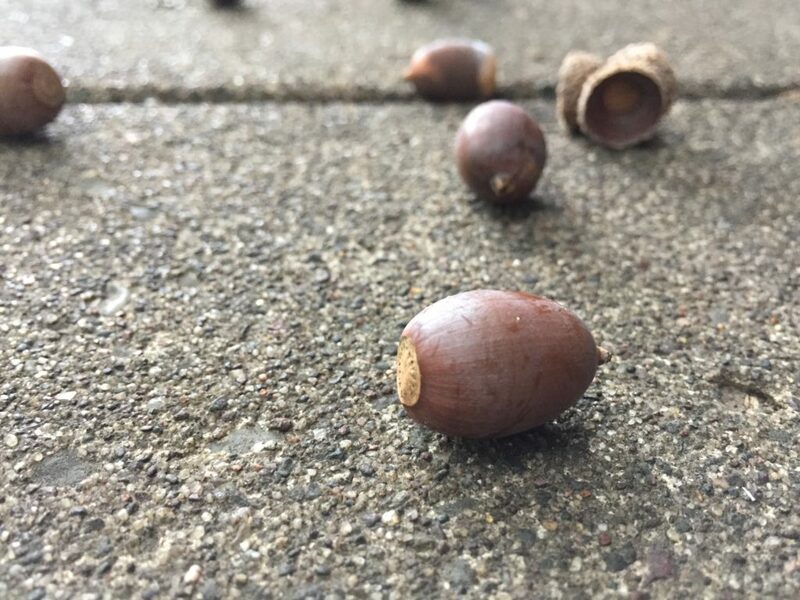 Returning with the phone, I squatted to take pictures of the acorns scattered on the sidewalk when I was hit on the head by an acorn! Unbeknownst to me, the squirrel had returned while I was inside and had renewed his bombardment! 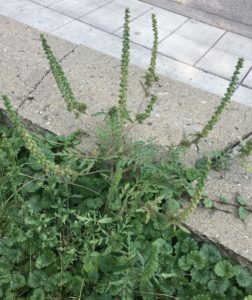 It was with dismay that I discovered there was ragweed growing in our front lawn. None of the plants were particularly large but, unfortunately, some had begun to flower. 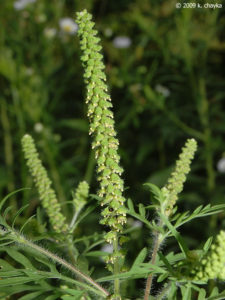 Ragweed pollen is a primary cause of allergic rhinitis, AKA hay fever in late summer and fall for many Midwesterners. While I am not allergic to ragweed, Kat is and, therefore, I have a particular anathema for ragweed. 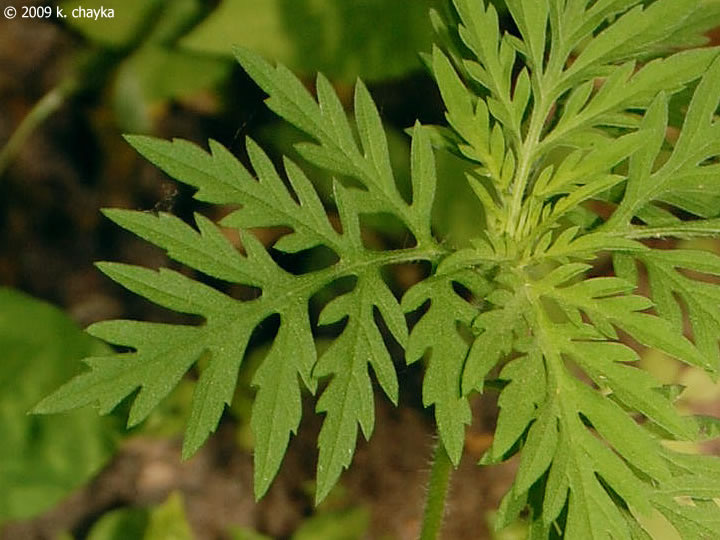 There are three species of ragweed native to Minnesota. Ragweed can be found growing everywhere in the Twin Cities, including along the medians and shoulders of freeways and highways. Because of its widespread prevalence, there is no chance of eradicating it. I just do my small part by removing it from our yard whenever I discover it. 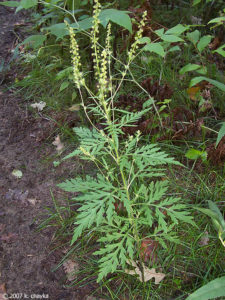 The following are photographs of Common Ragweed (Ambrosia artemisiifolia) taken by Katy Chayka of Minnesota Wildflowers. A point I would like to clear up is that goldenrod does not cause hay fever. 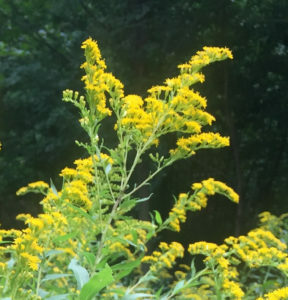 Goldenrod and ragweed are completely different species. Both are native to Minnesota, are widespread, bloom in late summer and fall, and grow near each other. Goldenrod (Solidago spp.) growing in our backyard. Goldenrod pollen is spread via pollinating insects whereas ragweed is dispersed via the wind. One clue that indicates goldenrod relies on insects for pollination is that its flowers are bright yellow. Ragweed flowers, not needing pollinating insects, are hardly noticeable. 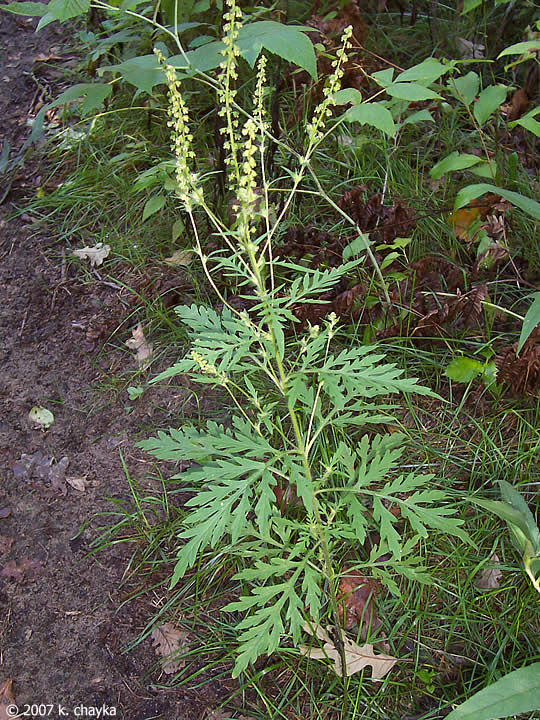 As such, whereas there may not be much goldenrod pollen floating in the air, ragweed needs to release a lot of pollen into the air. It is all the ragweed pollen floating in the air that triggers allergic rhinitis in so many people. While goldenrod can be a nuisance because it can crowd out other species, I much prefer the fields of goldenrod growing in our yard to the stands of ragweed along the highway. There are the remains of several dead trees in our back yard. The moss-covered remains a large weeping willow cover the ground in the southeast corner of our property. 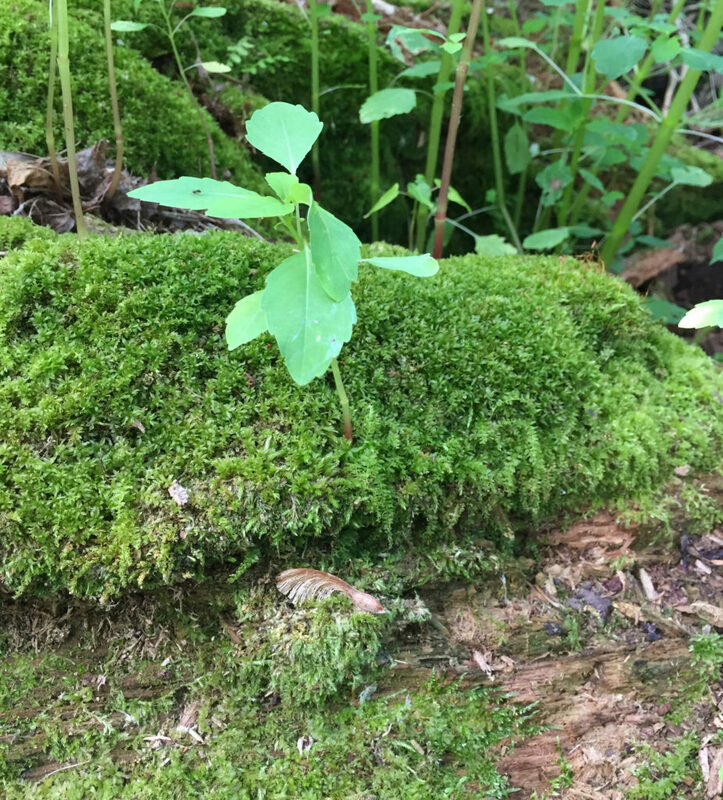 This year, I discovered that Spotted Touch-me-not (Impatiens capensis) was now growing on the moss-covered logs. 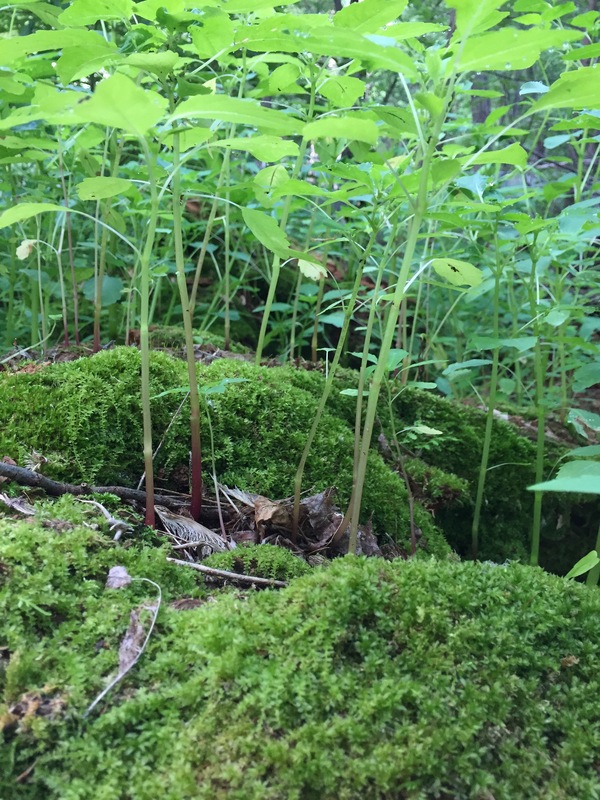 A “forest” of Impatiens capensis plants growing on a mossy log. Another tree blew down in a thunderstorm only a year ago, yet, already plants are growing from its remains. I’m not surprised, however. The tree trunk that fell down last year was the last trunk of three. The tree had been dying for years and there was a considerable amount of rotten wood in the core of the tree. 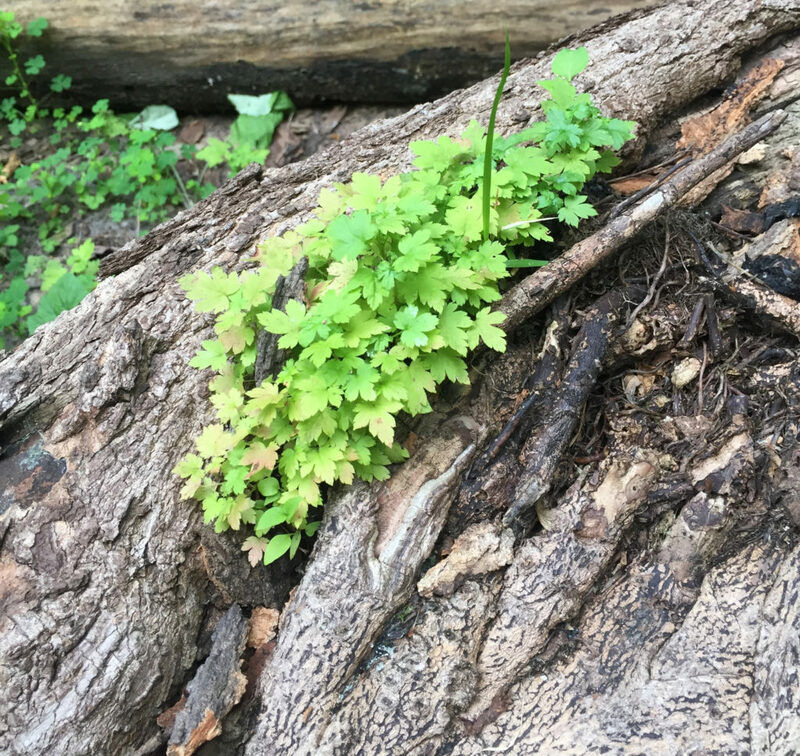 Plants growing on a recently fallen tree trunk. 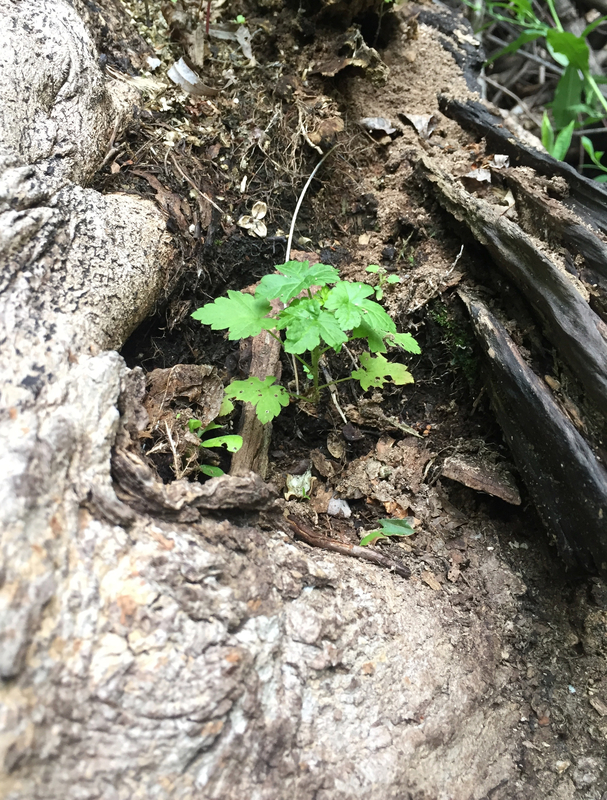 A plant growing in a cavity in a recently fallen tree trunk.